A pensive Steve McQueen in a screenshot from the movie Bullitt. The lens Laurie is talking about is not the finite cinematic glass which captured McQueen in such classics as Bullitt, The Magnificent Seven, The Getaway, Papillon, The Towering Inferno, The Sand Pebbles, The Blob and The Great Escape, but a wider lens which considers the vicissitudes of life in all its heartbreak, grime and hope-filled purposefulness. The grime in McQueen’s life – his troubled upbringing, mercurial temperament, hedonistic self-indulgence, and failed marriages to wives Neile Adams and Ali MacGraw – is fairly well known. As the biggest star in Hollywood for almost two decades, not much about Steve’s life went unreported. But once away from the glare of the klieg lights, in what amounted to self-imposed exile from Hollywood, most reporters missed what this critic would say is the biggest story of Steve McQueen’s life. How the two-fisted King of Cool found peace, when he encountered the King of Kings. At first glance, the reader may be reminded of the kind of inspirational tone evangelists employ while illustrating their sermons. Laurie is the Senior Pastor of Harvest Fellowship Church – one of the largest churches in North America – and host of the nationally syndicated radio program, A New Beginning. He has also authored some 70 books – many of which are aimed at new believers and non-believers looking for a concise explanation of the Christian Gospel. Laurie’s credentials are important, not only because he understands the Christian concept of redemption, but he has the name recognition and the trust which was needed to dig deeply into Steve McQueen’s heretofore hidden history. Friends and acquaintances of McQueen opened up to Laurie and co-writer Marshall Terrill with intimate details which fully flesh-out the various stages of the late actor’s life. Along the way, we meet some of Steve’s reform school classmates, Marine Corps comrades, New York and Hollywood co-stars, and a mix of the everyday folks McQueen enjoyed the most. This book has clearly been thoroughly researched by two veteran authors. That fact alone should entice anyone interested in the life of Steve McQueen. But there is a more compelling reason why Laurie is uniquely qualified to tell this particular story. Like McQueen, Laurie survived a similarly horrific childhood. Neither Steve McQueen nor Greg Laurie ever knew each one’s biological father. And both endured the abuse metered out by a series of men brought home by promiscuous, alcoholic mothers. “That’s my bedrock kinship with Steve McQueen,” writes Laurie. “Reading one of his biographies, I was stunned at the similarities in our childhoods. Absent a true father, McQueen latched onto several father-figures, including an uncle who taught him the value of hard work and an old pilot who taught him to fly. His strained relationship with his mother was equally problematic and manifested itself in a nearly life-long distrust of women in general. McQueen worked hard to overcome his hardscrabble upbringing – even as he wrestled with personal conflict. His legendary star-status is a testament to that success. Yet his glowing achievements on the screen proved ephemeral and his inner demons followed him most of his life. McQueen would finally find his answer – not on his deathbed, as some writers maintain – but in his own time and place before his cancer diagnosis – far-removed from the trappings of Tinseltown. The only gimmick with Laurie’s approach was his decision to undertake his cross-country search of Steve McQueen behind the wheel of a classic 1968 Mustang. 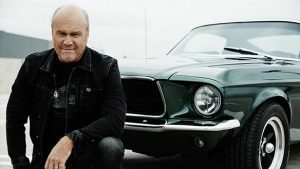 Author Greg Laurie with his 1968 Mustang. Piloting his own “Bullitt” is an interesting way to launch this adventure, though the Mustang mainly factors into the narrative, as Laurie ponders the high-speed chase for solace both he and McQueen undertook with their surprisingly parallel lives. Many of the similarities Laurie shared with McQueen may be found in an autobiographical documentary, titled Lost Boy: The Next Chapter. But for McQueen – a man who lost a fortune while making a film about racing cars – the most important story of his life would largely wait until after he died. McQueen may have exercised a quiet faith, as he endeavored near the end to mend long-broken fences. And most people don’t know that, when he attended church, he would always sit high in the balcony so as not to be a distraction. But those who knew him best said the change they witnessed in “The King of Cool” was palpable. His final tape-recorded message to his fellow cancer patients was filled with empathy and compassion. Steve McQueen began his meteoric climb playing an earnest teenager who tries to save a doomed man he found writhing in fear with a caustic blob attached to his hand. When McQueen’s own tumorous death came at age 50, he would not only be at peace, but be found clutching a book which promised him eternal life. Steve McQueen: The Salvation of an American Icon tells the story Steve himself said he wanted to share. It’s an engaging journey, fraught with heartache and hope – capped with a final leap more profound than Steve’s motorcycle jump in The Great Escape. 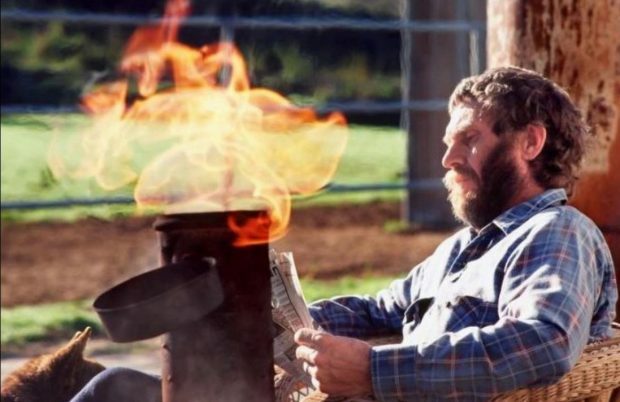 Steve McQueen having coffee, reading a newspaper, and enjoying an open fire in a lit smudge pot in the backyard of his Santa Paula home. Barbara Minty McQueen said it was his favorite part of the day. She took this last photo of him in the late spring of 1980.